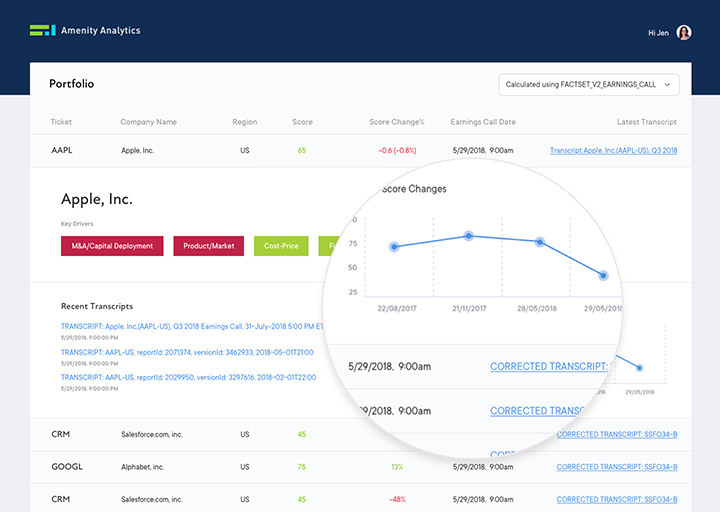 Earnings sentiment analysis just got easier. 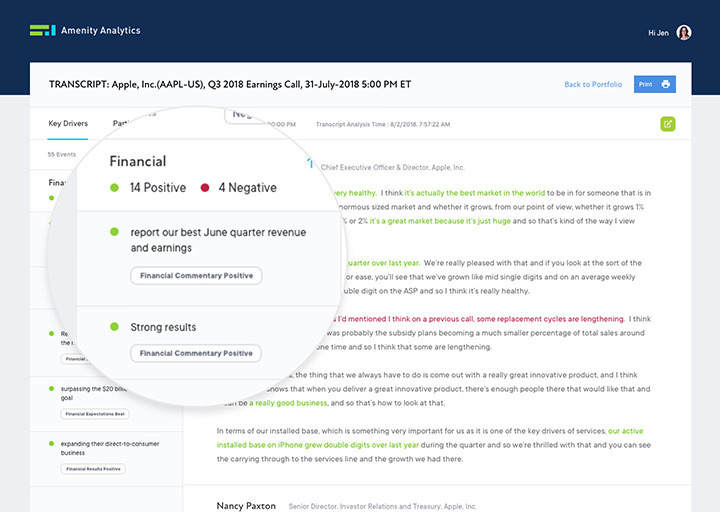 The Amenity Viewer systematically analyzes every earnings call transcript which enables you to spot outliers, identify critical insights, and understand key drivers. Amenity has created an "Amenity Score" to assess relative sentiment of individual transcripts and trends over time. Use the Amenity Score to find outliers and identify significant changes. 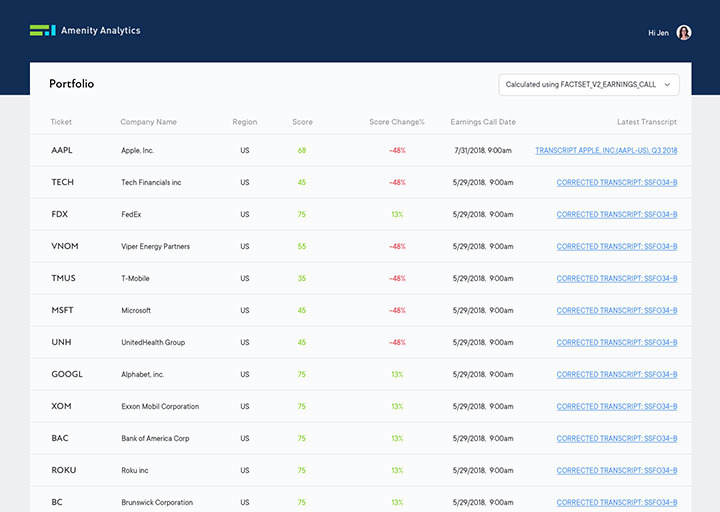 With a bird's eye view of the companies in your portfolio you'll see important new information and be able prioritize based on each company's Amenity score, percentage change vs last quarter, or date of the most recent earnings call. With Amenity Viewer you not only see what happened, but why. For each company, a summary of the commentary on business drivers that have changed is provided as well as a four quarter historical trend to completely revolutionize how earnings call analysis is conducted. Ready to make earnings season easier? Start using Viewer today. Navigate transcripts, see clustering, and uncover themes within transcripts. Summarize your most important findings, create a PDF of the highlighted transcript as well as a topline summary of the key drivers. Try it now for free. No credit card needed. 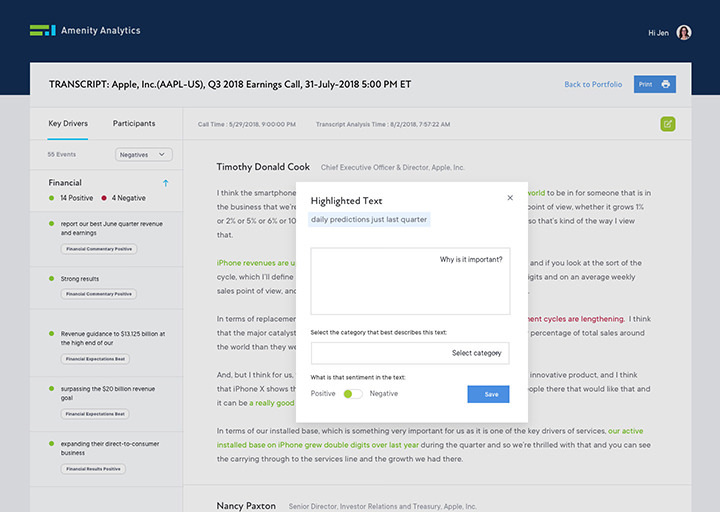 Our text analytics model adds an important lens to your earnings call analysis, drawing insights and categorizing them by key drivers to allow for easy navigation within the transcript. Key drivers can be sorted by number of extractions, number of positives or negatives or net positive/negative to identify important commentary. And these insights can all be seen within the context of the full transcript. User annotation feature enables model customization and ongoing improvement. You can highlight additional text, explain its significance and categorize it by topic and polarity. As changes across users are added to the NLP model, the Amenity Viewer becomes a force multiplier, leveraging additional perspectives. Ready to get more from your earnings call analysis? Get access to one year of transcripts from thousands of companies across all sectors and market capitalization. Our team of Financial Services Specialists are ready to provide support in any way you need. We are here to help you understand and interpret the data, as well as integrate insights into your workflow. You name it, we have the experts. You can access Viewer by requesting to join our Beta. Once qualified, you will receive a link to launch the platform. Where does Amenity Viewer get its data? We partner with a variety of leading third party data providers including S&P, FactSet, LexisNexis, and EDGAR Online. Our model is trained to capture financial insights and can be applied to any relevant text. How can I learn how to use the Viewer? Training is not required to start using Viewer, but we have resources that highlight our features and provide a quick tour of our capabilities. We host private demos, for both new and expert users. Sign up for one today! Wondering: “It would be great if the Viewer did…”? can seamlessly roll our regular product updates with new features to all users. Stay tuned for announcements about new features and send your feature requests to contact@amenityanalytics.com.